Description: Cosmic Purple has purple skin and a coreless, orangeflesh. 6" to 11" long. Sweet and tasty. Solar Yellow is bright yellow inside and out. 6" long, sweet, extra crunchy and juicy. Lunar White is an all white carrot, 5" long. Tall, vigorous plant, mild, delicious flavor. Atomic Red is a deep red, tapering root 11" long. Very crispy and high in lycopene. 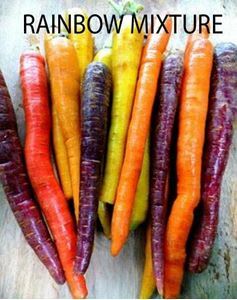 All carrots hold their color well when cooked. Mild, sweet onion flavor. pinkish-white skin and flesh. Noted for its consistently blue flesh and purplish-blue skin. Very good yields. Completely round, brownish-yellow bulbs with excellent flavor.